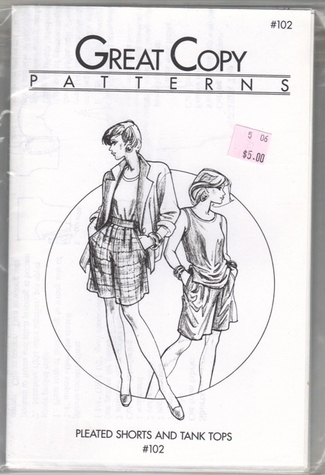 Great Copy Pattern #102 Pleated Shorts and Tank Top. This a multi-sized pattern including Ex-Sm thru Ex-Lg. The pleated shorts feature front pleats and angle stitched pockets. The waist band is smooth in the front and gathered at the sides and back. View A tank top features a high neck with back slit opening. View B features a scoop neck. Both views are finished with bias cut trim. Both views can also be completed with a Quick Serge Method. For Knit or woven fabrics. Pattern is in new, uncut, in original packaging.